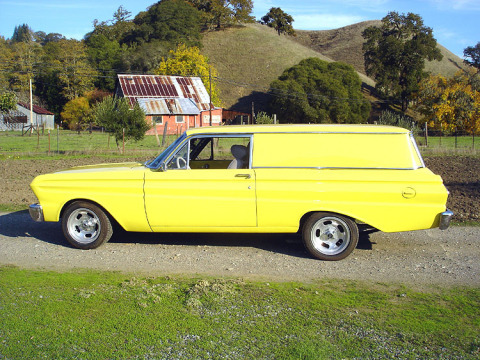 Car Information: 1964 Sedan Delivery Deluxe: Car is coded 78B. There were only 98 of them made. I know of one other on the East Coast that may or may not be running at this point- there may be more, but very few I suspect. The differences between the Sedan Delivery and Sedan Delivery Deluxe are fairly minor (arm rest, chrome trim etc. ), but for whatever reason Ford decided a separate body code was warranted. This car is a strong runner with numerous modifications(302 roller, modified interior, Versailles rear end, disks all around, 15" American Mag wheels, performance exhaust, power bucket seats in front, Vintage air, a newer radio/cassette with rear speakers, fold down rear passenger seat). Needs a little repair to the gutters (we did one side already) and possibly a brake job. Car was restored in 1997. I have owned it since 2000 and have put on very limited additional miles. $16K obo. Serious only. Want to own the only one- we sure have had fun with it but alas life has cut into how much time we have for these old cars. An article about this vehicle can be found on the SCFF website at http://www.westcoastfalcons.com/scff/member/charlie.htm. A second article dealing with sedan deliveries generally appears at http://www.westcoastfalcons.com/scff/histriv/sedandelivery.htm. Contact Douglas at (707) 894-9407 or email at dlaurice@earthlink.net.